Roots are up to 3-5 inches in diameter, globe shaped, clean and smooth. Upper portion is bright reddish-purple, and pure white below. Flesh is white, fine textured and tender with a sweet, mild flavor. Tops are medium-large, erect, dark green and of fine flavor. Turnips may be broadcast among the corn at last cultivation. Just before severe frost, lift the roots and store for the winter. Matures in - 55 days. 13000 Seeds/oz. Plant 1/2oz per 100ft row. 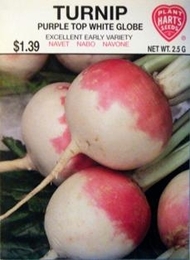 2lbs of Turnip seed needed per acre. Average Turnip yield per acre - 400 bushels.